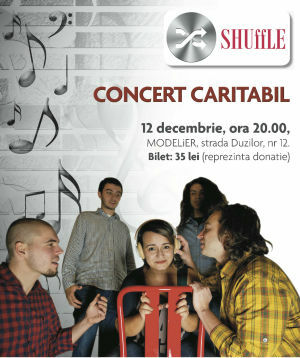 With Christmas round the corner, MODELiER is hosting a charity concert, on December, the 12th from 20:00. Music by the local band Shuffle, a glass of wine as welcome drink, sweets from Zizou and of course the joy of making the children at Casa Lidia a little happier this year will be the starting point of Christmas Holidays. The event aims to support Casa Lidia Foundation. The entrance ticket (35 lei) will ensure your individual contribution to repair the roof of the children's home. The Foundation is a children's home, located in the village of Domnesti. It helps abandoned or orphaned children to live in a family and to build their own lives. The Foundation's beneficiaries are minors in difficulty, aged between 3 and 18 years of age without discrimination of gender, race, ethnicity or religion. In addition, you can donate during the event nonperishable and medicines. "Happy Children Christmas Party #3 @ MODELiER" Party in Bucharest. You can get here description, reviews, address, time and details of "Happy Children Christmas Party #3 @ MODELiER" Party in Bucharest. Visit Bucharest Tips for more Party events in Bucharest!